Altium-i10 – Like being on top of a mountain? 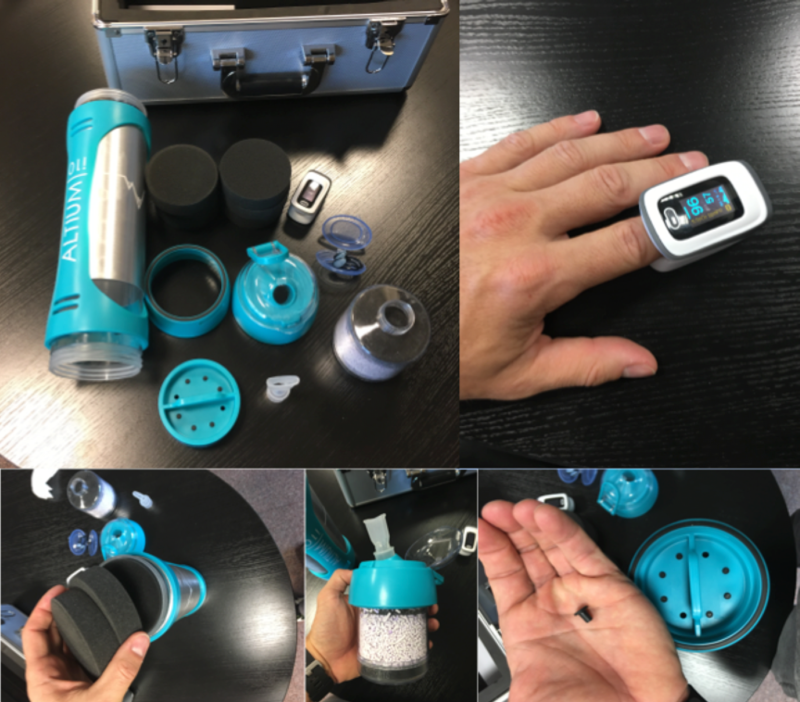 Purpose: To deliver the benefits of altitude training at home. 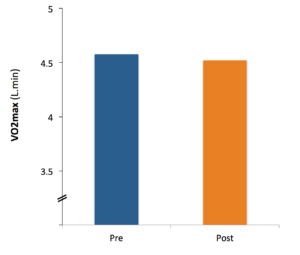 Summary – Pros: May work in swimming / Cons: Expensive, no clear benefit on lactate threshold or power at lactate threshold, no effect on hct and hb. For elite athletes high altitude training has been regarded as ‘must have’ component in the preparation for elite endurance sports. The reason for this is that hypoxic (low oxygen) stress at altitude (note this ‘at altitude’) facilitates key physiological and biochemical adaptations that may improve performance at sea-level. 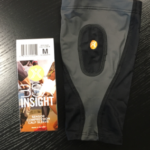 In order to tap into the beneficial effects of altitude adaptation and performance enhancement comes the Altium i10 a piece of equipment that allows you to breath a lower level of oxygen (resulting in hypoxia – low blood oxygen) followed by normal breathing (reoxygenation). The intermitted hypoxia (IH) is suggested to trigger a response similar to that obtained at altitude. It’s as simple as that. Figure 2. From Top left to right – Altium taken apart, pulse oximeter, foam disks to alter chamber volume, CO2 scrubber cartridge and mouthpiece, flow controller. The Altium oximeter links to an app for your iPhone which shows your O2 levels and pulse and most importantly tells you when to start and stop breathing on the Altium (6 minute on with 4 mins rest for each interval). 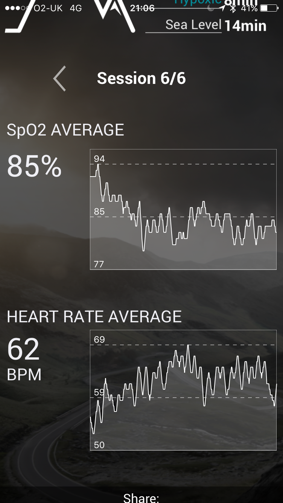 At the end of the 1 Hour session you get a summary for each of your 6 intervals showing how long you spent at certain levels of O2 and what that equates to in relation to altitude. 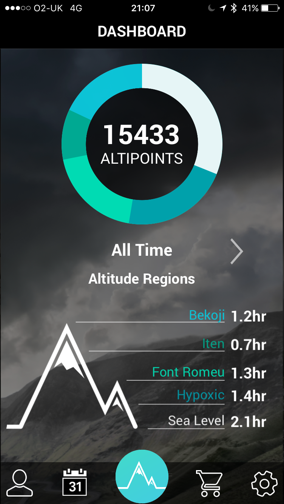 The app then gives you a summary of all session and converts them into what they term ‘ALTIPOINTS’ – the more time at higher altitude the more points. I have to say the 1ST few sessions took some playing about with to get the volume of the cylinder and the flow rate just right so that your O2 levels didn’t drop to low. If they drop to low the app stops recording until you O2 gets back up to what they view a safe range. I found this really irritating aspect of using the app and the Altium but I can see why the do it i.e. safety and to stop you passing out. However, I would love and option to just switch this off. Figure 3. Altium accumulated scores and example of o2 results from a 6 minutes sessions as recorded on the Altium i10 App. The other issue is you need also to get use to when the CO2 scrubber has to be changed. This becomes obvious if you know what to look for and this indicated by either, 1. Colour change in the CO2 scrubber from white to purple, 2. The O2 levels become difficult to keep low no matter how you breathe. OK so that’s how it works but what about the science behind it? Over the past decade, the use of hypoxic training techniques has become increasingly popular, especially living high (altitude) and training low (LHTL). Traditionally, this LHTL protocol requires long exposure time of >12-14d to receive a sufficient ‘hypoxic’ impact that adaptation and performance benefits result. As such the duration such an intervention can be prohibitive for many athletes due to cost and availability. Another model is live low and train high (LLTH) where exposure to hypoxic conditions are of shorter duration (<3hr, 2-5 x a week). However, this duration has been shown not to deliver the benefits of LHTL and LLTH methods. With reference to the Altium another short duration (<3 h) hypoxic technique is intermittent hypoxic exposure (IHE) where no training is performed during exposure sessions. This has been show through a comprehensive review of published studies up until 2010 concluded that IHE alone does not lead to sustained physiological adaptations or improved exercise performance. However, another study looking at published research concluded that IHE may improve performance in sub-elite athletes, but not elite athletes owing to the fact that elites experience more hypoxia from their day-2-day higher intensities of training compared with sub-elite athletes. Some additional study data from 2014 shows a single 4-hour exposure at 300m with no impact on genes related altitude adaptation. One study looked at IHE (7 x 1 hour/day at 4500m at rest) and its impact on physiological responses (at 2 submaximal workloads at simulated altitudes of 2000 m, 3000 m, and 4000 m). Subjects where tested pre and post altitude exposure and the results showed blood lactate concentrations and CO2 output were reduced following altitude exposure. It was suggested that the effect might have been caused by an improvement in aerobic power resulting in lower relative exercise intensity after IHE. However, based on the study data it is not likely that aerobic power was improved because neither haematological parameters (i.e. haemoglobin concentration) nor heart rate as an indicator of relative exercise intensity had changed after the IHE application. Furthermore, the study did not assess exercise performance so although there may have been some physiological changes there was no proof of a performance benefit. The Altium from what I can find has been tested at a University but at present the study is unpublished. 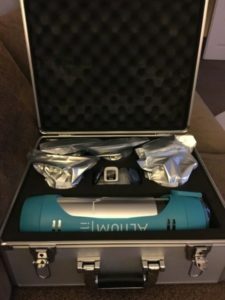 The study on 13 competitive cyclists and triathletes used the Altium every other day for 28 days (14 sessions) using 6 mins of Altium breathing and 4 minutes off for 60 minutes per session. Prior to and post Altium use subjects underwent a lactate threshold test followed by a V02max test. There where no changes to haemoglobin (oxygen carrying protein) and haematocrit (amount of oxygen carrying red cells). Therefore, the results of the IHE study (7 x 1 hour/day at 4500m at rest) I discuss above may suggest the results on the Altium from the UWS may be effective if these responses translate to a performance effect. To date other than Altium’s own unpublished (not in peer review journal not conference abstract) research carried out at the UWS there is no direct evidence to show that the suggested method of use of the Altium i.e. 1 hour per day for 14 days or every other day for 28 days deliver performance benefits. 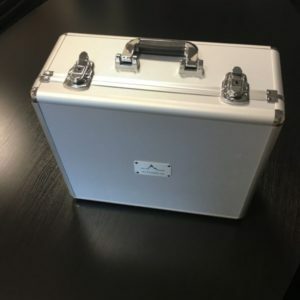 I asked the makers of the Altium for a rationale based on published data that supports the protocol but none was provided so I cannot say what the basis is for the way the Altium is suggested to be used. One other issue and this is important – Altitude is not only about low levels of oxygen in the body. There is also the issue of ‘Partial pressure’ of oxygen. As we get higher (increase in altitude) the pressure decreases and although the percentage of oxygen we breathe in remains the same (circa 21%) the number of all molecules in the air including oxygen decreases. Therefore, the low oxygen tension (pressure) in the air we breath results in low oxygen availability. Therefore, unlike the Altium the way oxygen availability occurs at Altitude may result in different effects on the body. 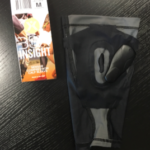 I have to say from the outset I am only ‘one’ subject (a case study) and in science this would be viewed as a case study therefore my results may not be representative of others using this product. However, that does not make my results (see below) irrelevant in relation to my own experience and benefits from using the product in the absence of a peer reviewed study. As with any piece of technology ‘free speed’ or ‘free performance’ benefits without having to train to get them are a great idea. As with this and other blogs I want to try them out to see if they really work, especially if they come with a big price tag. OK let’s get down to the results…. The pre test for the Altium was pre (19th August) and post (September 9th) with use of the Altium for 14 days starting on the 24th August and last day of use 7th September (14 days). 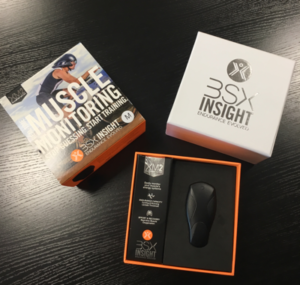 So for the actual testing we carried out a Lactate threshold test following the same protocol as per the BSX (See my previous BSX blog). That means each stage lasting 3 minutes and increasing 20 watts per stage. During the test blood lactate was taken for every stage as was inspired and expired O2 and CO2. Also pre and post-test haemoglobin and haematocrit was measured. 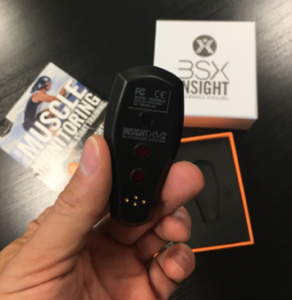 During the test I also wore the BSX insights as a secondary measure to assess lactate threshold (and blood measures of threshold pre and post match almost identically to that of the BSX). The following is the data from the test results but first its important to establish the rate of change in fitness and adaptation occurring through my training alone. As such the first figure shows a number of lactate threshold tests taken around every week with the BSX building up to the laboratory tests. 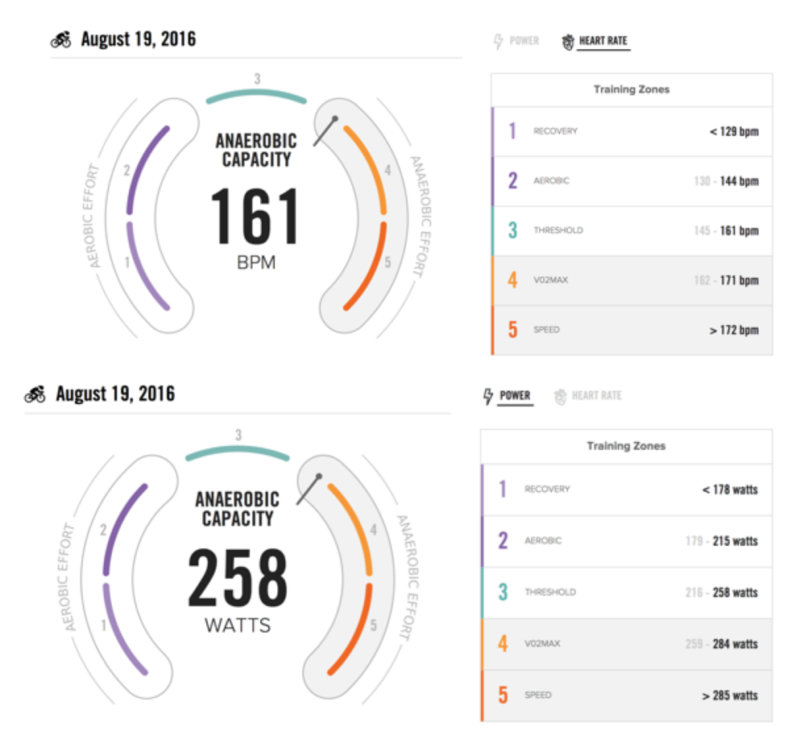 As you can see there is a steady increase in watts at lactate threshold of about 3/4 watts per week. 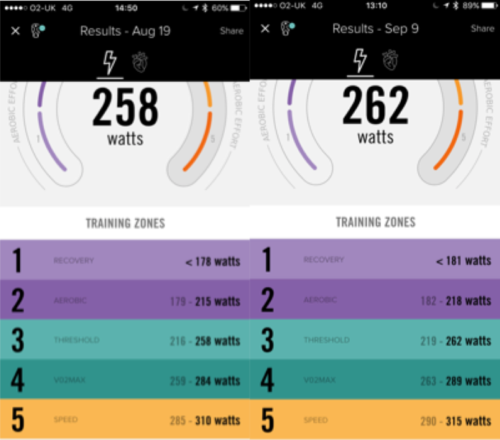 This data is useful as it can be used to see if the Altium really changes performance above that from exercise alone. 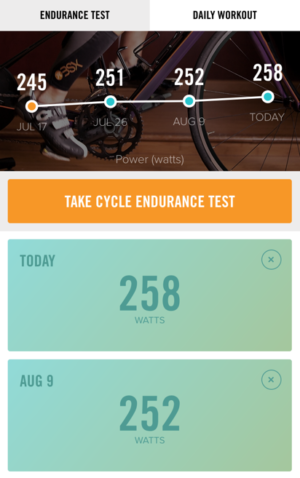 Most blogs and reviews I have seen on the Altium have said they think it worked but because I was not consistent in my training or they didn’t measure effects of training on performance and or LT running up to the test we don’t know for sure if it’s the training or Altium causing the performance enhancement. As such my monitoring pre use of the Altium I believe makes this review very relevant and tightly controlled. The BSX demonstrated that over the course of using the Altium – threshold increased circa 5/6 watts, which was not different from the June from July 17 to July 26th. Results pre and post Altium use. 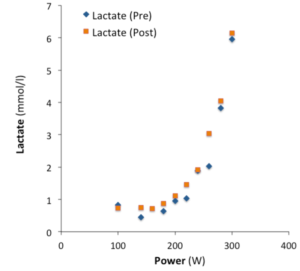 Lactate threshold: The impact of the Altium pre and post-test did not increase watts at threshold (250w based on blood analysis, slightly higher by the BSx) to a greater extent than the improvements occurring as a result of training alone. As such the Altium seems not to result in a beneficial impact on lactate threshold (See figures 5 and 6). Figure 6. 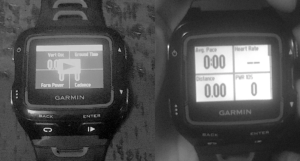 Lactate threshold pre and post Altium use. Hematocrit is a measure of the proportion of blood volume that is occupied by red blood cells. The higher your hematocrit, the more oxygen can be delivered per volume of blood. Haemoglobin is a protein that binds to oxygen in the lungs so that the oxygen can be transported to the rest of the body. Therefore, increasing the amount of haemoglobin in the blood increases the amount of oxygen that can be carried and is a feature of altitude acclimatization. A normal value for hemoglobin is 13.5 to 17.5 grams per deciliter (g/dl), and 38.8 to 50% for hematocrit. As can be seen from Figure 7 my values are in the normal range and although these values can be impacted by hydration and training status they did not significantly change over the course of using the Altium. This result was expected and not something that the company behind the Altium have suggested would alter and confirms the results in their UWS study. Because Hb and Hct they can be reflective of a change in oxygen carrying capacity they are worth testing pre and post-test. As we know the are limits placed on athletes by the likes of the Union Cycliste Internationale (UCI) for a haematocrit of 50% and international skiing federation (FIS) 18.5 g/dl for hemoglobin. This is in a bid to stop and detect the use of EPO therefore any big effects from the Altium would have been important for athletes undergoing such testing. Figure 7. 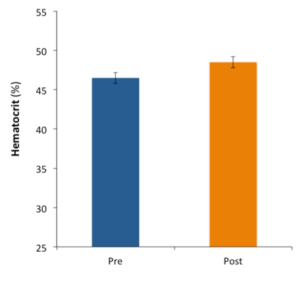 Pre and post haemoglobin and haematocrit values. VO2max is the volume of oxygen can be consumed while exercising at your maximum capacity or often called your maximal aerobic capacity. Unlike hematocrit and hemaglobin the effects of altitude on VO2max are not clear with some studies showing an increase but others have shown a decrease as the body becomes more efficient at delivering oxygen for the same intensity of work. We also tested VO2max levels pre and post the use of the Altium and in Figure 8 we can see that pre and post use there where no significant changes in VO2max. Figure 8. VO2max (absolute) measured pre and post Altium use. The 1ST thing to say is I only measured the impact of the Altium i10 on ‘cycling’ performance and physiological changes during a cycling test. Therefore, it is possible there could be performance benefits for running and or swimming. There are also limitations in the test in so far as the measurement of VO2max as would normally only be measured during shorter duration test time frame i.e. 10-15minutes. However, the conditions of the test pre and post Altium use are the same and therefore the maximum VO2 reached is relevant. Furthermore, threshold (lactate) maybe determined using different mathematical models and this can significantly impact the results of the test out come. 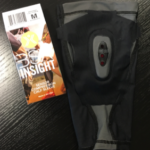 As such we used a selection of methods including logging the data and visually examining threshold, used a modified dmax method, also used the BSX insights. All demonstrated no significant improvement in threshold pre and post Altium use. We have not inserted the lines on figure 6 above as we feel even the non-scientist can see the blood values do not differ significantly pre and post Altium use. Before I give a final conclusion I can say I wished I had completed a critical speed or some other performance test for swimming. The reason is I felt that there was some significant gains over the course of using the Altium. 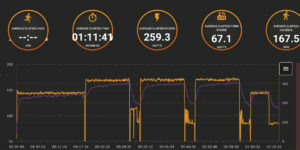 Now this may be as a result of training or training plus the Altium I don’t know as I didn’t take a measure of swim performance running up to Altium use or post use. Anecdotally I can say that swimming became faster over the weeks and the perceived exertion was lower. My feeling is that this might be the right home for the Altium as swimming aid and by its very nature swimming is hypoxic especially for those breathing less every stroke. As such the exposure to higher CO2 / lower O2 my impact the bodies tolerance and as such the need to breath. The result would be perhaps an ability to maintain a more efficient head down position in the water thereby making the swim more streamlined and faster. Clearly more work needed here. In relation to cycling my ‘own’ results simply don’t warrant the Altium as a performance enhancer (no increased watts at lactate threshold, changes in haemoglobin or haematocrit or VO2max). As such for me the expenditure was not worth it as it did not benefit performance beyond what I was experiencing with training. For the makers of the Altium I feel there is a lot more work to be done on the testing side and specifically the development of the protocol. So would a 7 day 2 hours a day protocol have impacted my results differently (i.e. 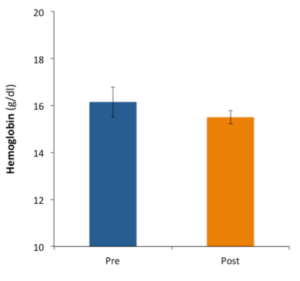 greater hypoxic stimulus but more acute) to the current protocols? What about the maintenance phase? Where is the evidence for this? What about a study assessing the effects of the Altium in more hypoxic sports such as swimming? Those who have completed an Ironman swim know exactly how hypoxic that can get and perhaps there is something to be said for the Altium in that regards. There are issues of blinding. 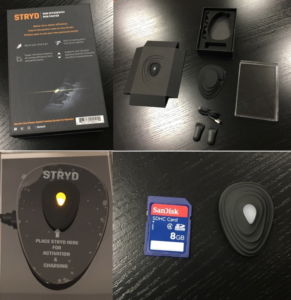 Blinding relates to the fact knowing you using a product you believe enhances performance results in enhanced performance through placebo effect. By using a mix of a product or protocol that does not lower O2 vs the Altium and its suggested protocol we can assess if any performance benefits are delivered by placebo (i.e. subjects are blinded to using a performance enhancer). However, that said when using this sort of equipment its unlikely watts at lactate threshold can be impacted. Similarly, care should be taken over the run into any program over the training status and rate of performance improvements athletes are undergoing. So for my test we measure threshold in the 4 weeks pre testing to see the improvements to be made on a week-by-week basis. Similarly, the volume and intensity over the 2 weeks of the Altium use was similar. Was this assessed for the testing done by UWS? Finally, price point – this is a big punt to spend almost £500 and for that I think most consumers want a guarantee of efficacy. But these are the risks of early adoption of technology. Wilber RL, Stray-Gundersen J, Levine BD. Effect of hypoxic ‘‘dose’’ on physiological responses and sea-level performance. Med Sci Sports Exerc. 2007;39(9):1590–9. Billaut F. A higher calling, but does altitude training work? 2011. http://theconversation.edu.au/a-higher-calling-but-does-altitudetraining-work-3055. Accessed 10 Oct 2012. Millet GP, Roels B, Schmitt L, et al. Combining hypoxic methods for peak performance. Sports Med. 2010;40(1):1–25. Bonetti DL, Hopkins WG. Sea-level exercise performance following adaptation to hypoxia: a meta-analysis. Sports Med. 2009;39(2):107–27.